Extra Square Footage - On average, a garage measures 360 square feet! That’s 360 square feet of extra space useful for a game room, man cave, gym or wherever else your imagination takes you. Enjoy a brand new room combined with fresh Florida breeze. Privacy and Security - With a retractable screen door on your Florida home’s garage, you can see out easily, and it’s harder for others to see inside. Without a retractable screen, an open garage door is kind of an open invitation for the neighbors to see everything you’re doing. Keeps you bug-free - No matter what time of year it is in Florida, those pesky bugs seem to find a way to get to you. A retractable screen door on your garage lets you enjoy your Florida garage space free of pesky mosquitos, insects and other pests that spend their days and nights in Florida’s great outdoors. A retractable garage screen lets you enjoy your garage and the outside protected from the outdoor elements. Fresh Florida Air - This time of year is the greatest time of year in the Sunshine State. A lovely, serene, relaxing environment outside in the fresh air is yours to enjoy by screening in the garage door. 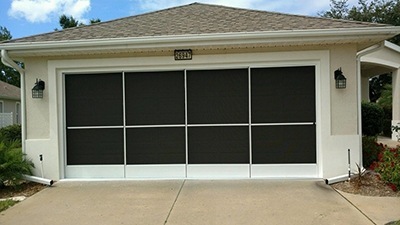 Fits like a glove - A retractable screen door for your garage can be customized to fit your particular garage size and comes in colors like black, white and charcoal to blend with your existing garage door perfectly.